Also, for those of you who have eaten at a particular Italian restaurant chain and heard of a soup with this name, this is not that soup. Maybe it was, once (I’ve never tried theirs so I don’t even know), and it certainly has some of the same ingredients, but I’ve changed the recipe I began with enough that, if anything, this is the (distant?) Italian cousin of their Zuppa. 1-2 t. herbs – my favorites are oregano and crushed rosemary. In a dutch oven or large saucepan, brown the sausage. Remove from pan, keeping the grease. If needed, add a little olive oil to the pan to equal 1-2 T. Over medium heat, saute the onion, garlic, red pepper, herbs, and bacon, until the onion is translucent. Add 6 c. chicken stock and shredded chicken, and bring to a boil. Add the potatoes, and additional stock or water as needed to keep the soup brothy enough. 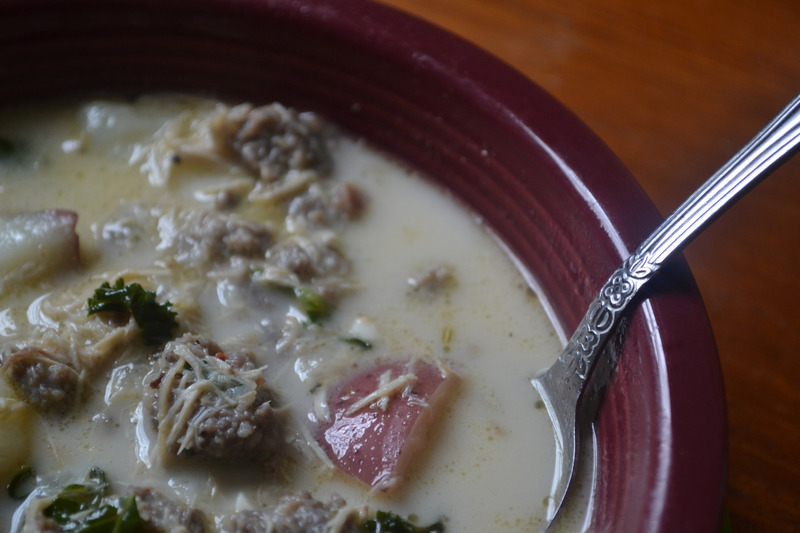 When the potatoes are nearing fork-tenderness, mix the kale and cooked sausage into the soup. Simmer for 5 minutes, until the kale is soft. Remove from heat and stir in the heavy cream. Season with salt or pepper to taste, and serve immediately. This soup is immensely more attractive when freshly made, but the leftovers taste just as good. Tags: gluten free, Italian, recipe, soup. Bookmark the permalink.